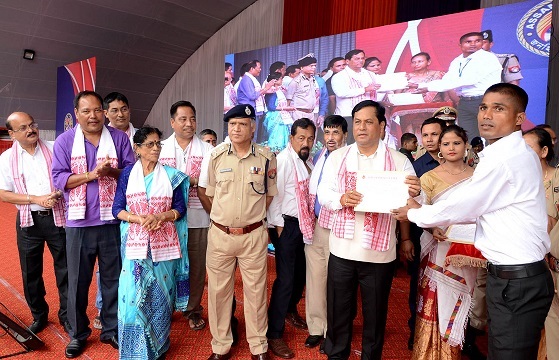 Assam Chief Minister Sarbananda Sonowal handed over appointment letters to 1,373 constables who have been inducted into Armed Branch of Assam Police at a function held at the Veterinary College Play ground on Friday. Speaking on the occasion, Sonowal said the government is committed to its mission of working for the safety and security of 3.30 crore people and has been working for the equal development of all sections of the people of the state. According to Sonowal, over the last two years people’s perception towards Assam Police has undergone a positive change. He however, called upon the Assam Police personnel to work more dedicatedly to enhance their credibility more than ever before. Referring to late former Prime Minister Atal Bihari Vajapyee who introduced good governance in every sphere of life, Sonowal said that the present Prime Minister Narendra Modi also led the nation to script tangible changes in every field. The present state government is also working hard to strengthen the edifice of good governance to fulfill the aims and aspirations of the people of the state, he said. The chief minister hailed the role of 70,000 Assam Police personnel in maintaining law and order in the aftermath of draft publication of final NRC. He also called upon the newly appointed constables of Assam Police to adopt the mentality of people’s welfare and render their services accordingly. He also urged upon the parents of the newly inducted constables of Assam Police to motivate them to work with honesty in future as well. Speaking on the occasion, MP Bijaya Chakraborty said that under the present state government many family members belonging to below poverty line secured government jobs. Rajya Sabha MP Biswajit Daimary while speaking on the occasion, urged upon the newly appointed constables to dedicate to the service of the state. Speaking on the occasion, Dispur legislator Atul Bora said Assam Police has great role to play towards government’s avowed agenda of making Assam free from corruption, terrorism, illegal immigration and pollution. Lakhimpur MP Pradan Baruah, MLAs Dr Ranuj Pegu, Thaneswar Basumatary, Ramendra Narayan Kalita, Media Advisor to Chief Minister Hrishikesh Goswami, Legal Advisor Shantanu Bharali, DGP Kuladhar Saikia, and a host of senior officers of Assam Police were present on the occasion.